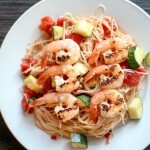 Shrimp and Zucchini Capellini is a pretty quick dinner option. My most recent posts have been so low-carb, whats up with that!? Sometimes we just have to have a plate of pasta for dinner! I love pasta, but I know I shouldn’t base my whole meal around carbohydrates only. To make it a more reasonable meal I try to add a lean protein and vegetables if possible. That way I end up satisfying my pasta craving while filling up on other nutrients that come from vegetables and proteins. Also this way, I can end up having a little less of the pasta because I fill up on the other things as well! 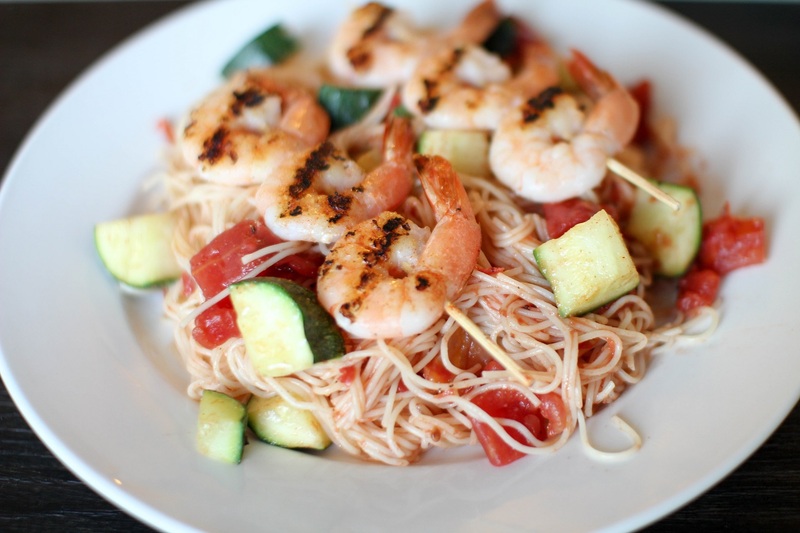 I love how little shrimp look on skewers! It’s just so cute. I prefer to cook them on skewers because it makes flipping them over so much easier for me so I don’t have to do them individually. Lazy, right? But then again it does take effort to put them on the skewers so maybe it’s not much easier in the long run. How you do it is up to you of course. Boil Pasta in a large stock pot. Put a grill pan on the stove top and start letting it get very hot. 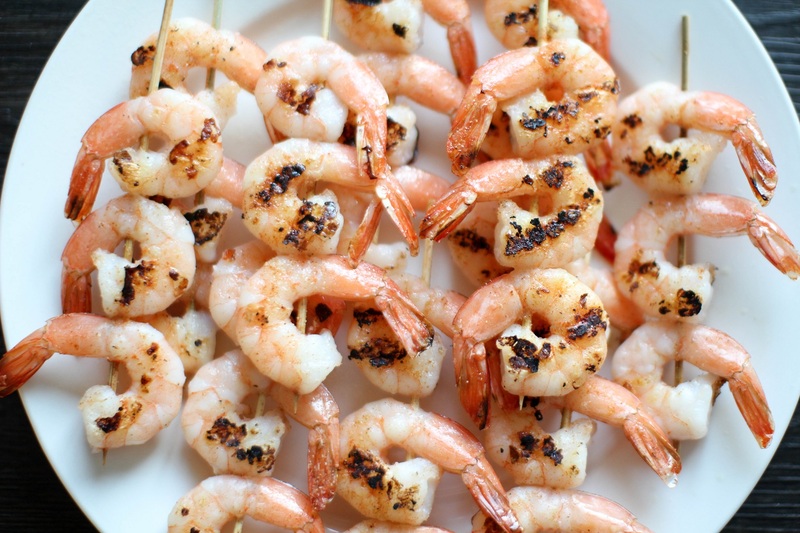 Prepare shrimp by putting them on soaked skewers. (you can skip the skewer step, I do this really to make the flipping process easier, and I just like how it looks). Sprinkle cajun seasoning over shrimp. Prepare zucchini by washing, quartering lengthwise, then chopping into ½ inch pieces. Begin cooking over med-high heat in a sauté pan ~5 minutes or until your desired texture; no oil needed. Add the shrimp to the very hot grill pan for 3-4 minutes, you will see them begin to turn pink. Flip, cook another 2-3 minutes and remove from heat. If you wish you can toss them in olive oil to finish. Once pasta is cooked drain and reserve ½ cup of the cooking water. Add pasta back to pot with reserved water, the diced tomatoes, the prepared zucchini, and olive oil to keep pasta from sticking. 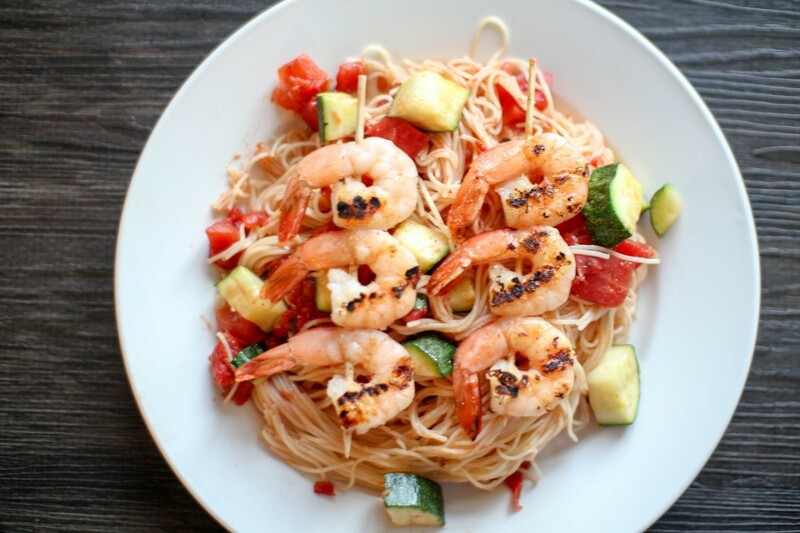 Serve with shrimp on top.